Hands can increase the flow of universal life energy into our bodies. Now, while this sound rather ordinary, there is little written documentation on receiving energy through the hands, only giving energy through the hands. First, we should understand what this energy is. Universal life energy permeates every living thing, including the air, our planet, the atmosphere and all of nature. The flow of this energy connects everything that exists, and is being constantly absorbed by humans at every moment. Now while it is naturally flowing through us, we can increase the inward flow should we be feeling drained, want to heal ourselves or others, or are doing specific energy work for our chakras. This vital energy is what keeps us alive and healthy so the ability to increase it at will is a good thing to know. Second, let's discuss the importance of our hands. The hands have been used as emitters of energy since the art of healing began. We know of the existence of the human body's electromagnetic energy field because high tech equipment, such as a SQUID (Superconducting Quantum Interference Device), EMG, EKG, and EEGs have been used to measure these extremely weak signals. These devices not only detect the presence of such energies, but can show how the laying on of hands (therapeutic touch), and other healing methods such as Reiki (which means Universal Life Energy) and Qi (which stands for Vital Force) can actually alter the subtle energy field of a subject. Another fascinating aspect to the hands is the power of its magnetism, in comparison to other major body parts. In 1963, researchers at Syracuse University reported the first measurements of the magnetic field of the human heart, just a millionth the strength of the earth's magnetic field. Ịn 1971, a SQUID was used to measure the magnetic field of the brain which was 100 times weaker then the heart. Finally, the magnetic field between the hands of healers were measured as 1 milligauss. This is less than 1% the strength of Earth's magnetic field, but 1000 times as strong as the magnetic field produced by the heart! What I was shown in terms of receiving energy through the hands was as follows. Lay flat on your back (no pillow) and extend your arms straight out so that you form a human T. Then, face your palms up. Visualize universal life energy coming into each of your hands (towards the center of the palms) then through your arms. Disseminate the energy either through your body entirely, or send it to a specific chakra that you are working on. The use of both of our hands allow us to receive energy in a balanced manner. Be sure to remove all jewelry from your hands as to not obstruct any energy flow. There is very little mention of this technique on the web and the few sites that I found who used a method similar to this (I only found two), did not say why they used this method. Reiki practitioners commonly bring their energy into themselves from the crown chakra, but do make use of the hands in a meditation called the Gassho. In this meditation they breath deeply, concentrate, and visualize light and energy flowing in through the hands to the Hara line and then back out again through the hands. The meditation has more to it then this, but I'm just illustrating that other energy rituals do use the hands for energy induction. I am also not stating here to drop other techniques. What I'm saying is use this in conjunction with your other methods of energy induction. After thinking about this awhile, I remembered another instance when I witnessed the taking in of energy through the hands, and it had to deal with astral vampires. I was in the astral when I observed what appeared to be Asian men, with advanced esoteric knowledge, taking the hands of hapless individuals who really weren't conscious enough in their environment to know what was going on. As they took their hands, they asked the person to repeat a sound after them, until a resonance was created. Once this resonance was met, they pulled the life energy force out of this individual. 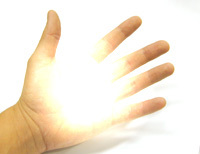 So it seems the hands are indeed powerful tools for energy transference! Most of the world's esoteric teachings, in written form, has been lost, burned or stolen over the ages. However, we are shown these teachings anew in altered states of consciousness and in the subtle planes, and it is up to us to bring it back and share it with others. I have been shown other complex formulas relating to spiritual growth, but unfortunately it was too much information to bring back with any kind of coherency. As I receive this and other bits of information, I will continue sharing it on my webpage. "You asked where I learned the "palm up" method. That particular medthod was given to my husband by one of his guides, a little very old Chinese healer. I was taught a "palm up" method years ago in Fort Lauderdale and have added to that since then. I've always "known" that I needed to channel the universal energy through me, through my hands and into the person I was working with. I never use my own energy but do take some of the energy going through me as it seems to be needed. Hope that helps."